The Mercedes-Benz S-Class is one of the automaker’s flagship models, and this means it’s crammed with technology and a bespoke hand crafted interior fit for a CEO, one who needs to be driven around but that likes to take the controls once in a while too. 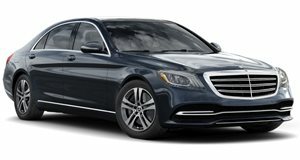 The Mercedes-Benz S-Class is available at a starting price of $89,900 for the S 450 with a 362 hp twin-turbocharged V6 and drive to the rear wheels as well as a good standard feature list. Before you get to AMG levels there’s the $102,900 S 560 4Matic with the 4.0-liter V8 that’s also twin-turbocharged to create 463 hp that drives all four wheels. The premium sedan is one of the best money can buy, which is good because you need a lot of it. Inside the cabin of a Mercedes-Benz S-Class you’ll find top quality luxury everywhere you look. There’s a split tone, leather-topped dashboard and the theme wraps around the interior extending along the dash on to the door panels. Once in the power adjustable driver’s seat with cooling, heating and a message function, you’re faced with a new design multifunction steering wheel that features touch control buttons as found on smartphones. The high raised center console is home to the drive mode dial and more controls for the infotainment system and on board functions. The main focus is the digital instrument cluster that seamlessly joins up with the screen for the infotainment on a large 12.3-inch display. With a car of this size you can expect lots of space, and there is, the rear is almost limousine like, which makes sense, as many people don’t really drive an S-Class, they get driven in one. A variety of packages take the tech and luxury even further, and it’s all handcrafted. Driving a Mercedes-Benz S-Class is meant to feel like floating on a cloud when cruising and a sharp and precise tool when driving hard, and that’s exactly what it’s like. Electronically controlled Airmatic semi-active suspension continually adjusts the ride firmness to keep things smooth or firm and stable, or lowers the ride height at high speed. The 4Matic all-wheel drive system also continually adjusts to maintain optimum traction at all times and works with a 4-wheel electronic traction system and other systems like torque vectoring, electronic stability and active brake assist. These systems are needed because the S-Class is quite rapid with all engine options, especially the more powerful biturbo V8. With so many electronic in play the steering feedback can feel a little dull, but you always know what the car wants to do and where it wants to go. The 9-speed automatic 9G-Tronic transmission has great ratios that not only make the car feel quite quick, it can also be super smooth with almost imperceptible gear changes. 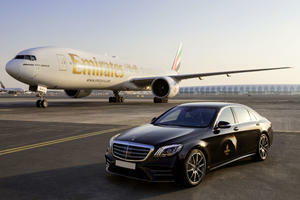 The Mercedes-Benz S-Class is large, but the available powerplants afford the car some rather impressive performance. The S 450 is powered by a twin-turbocharged 3.0-liter V6 with horsepower rated at 362, enough to get the car to 60 mph in 5.1-seconds in rear-wheel drive guise, and that drops to just 4.9-seconds. The bigger capacity 4.0-liter V8 is also twin-turbocharged and is rated a much higher 463 hp with a high 516 lb-ft of torque and as a result, is propelled to 60 mph in as little as 4.6-seconds, a time that defies the car’s size. 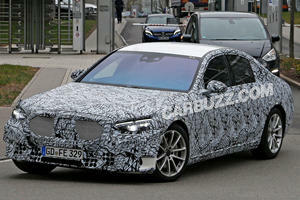 There is an AMG-fettled version too with 603 hp but that’s another story. Mercedes-Benz is synonymous with safety, and it’s no different in the S-Class. Systems include active brake assist, adaptive high beam assist, lane keep assist, crosswind and blind spot assist and a first – the Mercedes-Benz Pre-Safe system. This one detects instability in certain situations and prepares the occupants for possible impact by tightening belts and closing the windows and sunroof. Options include a driver assistance package with even more features, an executive rear seat package that makes the car perfect transport for a businessman on the move that includes heated and cooled cup holders. There’s also an audio package that features a Burmeister surround sound with FrontBass to rock things up a bit. For those wanting those an executive sedan with some of the best spec and features on the market, the Mercedes-Benz S-Class is one of the top choices. Inside the fit and finish of the premium hand-crafted materials is pretty much perfect and with the way things can be customized means a unique package can be tailored to suit specific tastes. The right engine and transmission combinations make for a powerful sedan with brilliant performance, but all of this comes with a premium price tag too. That said, buyers in this segment are more concerned with the quality than the pricing. 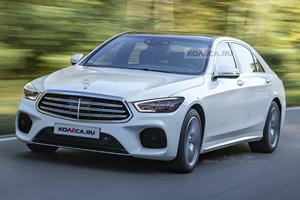 Would You Be Upset If The New S-Class Looked Like This?